Aalokam strives to provide the South Asian diaspora in the New York tristate area continued access to their cultural roots and to introduce South Asian performing arts to the western world. One of Aalokam’s core activities is education. We offer on-going classes in Indian classical music and dance in the New York City area and the highlight of our school is the emphasis we place on an open culture within our classrooms – an inclusive learning environment, a safe space to challenge oneself, increase awareness of body, space, rhythm and expression and through that foster creative freedom to convey one’s story through Indian classical dance and music. 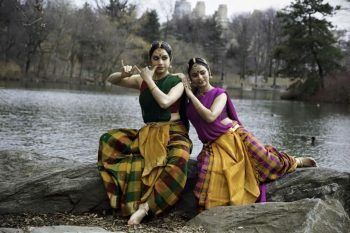 Aalokam dance company marks the coming together of two talented Bharatnatyam dancers, Bharathi Penneswaran and Jyotsna Kalyansundar. Trained in the Kalakshetra style, both bring together more than 20 years of experience each in training, performing Bharatnatyam in India and in USA. The idea behind Aalokam is to showcase the elegance and beauty of this classical Indian dance form through innovative set pieces. Combining rhythm, hand gestures and facial expressions, these dance pieces convey exotic tales from Indian mythology and folklore.